One of the reasons Dryfta event platform is used by universities, non-profits and corporate is the platform’s ability to collect abstract and paper submissions and assign them to reviewers, apart from other features that it is capable of. This blog post quickly explains how authors can submit abstracts and manage submitted abstracts. To access the abstract submission site, one needs to log in using email and password. To access the abstract submission site if one doesn’t have login credentials, author has to create an account first. After creating an account, go to the abstract submissions login page, and enter the login credentials (email and password) to log in to the abstract system. Once logged-in, go to My Abstracts page and click on Submit Abstract button to submit an abstract or paper. To edit an existing abstract, click on the name of the abstract which you want to edit. Authors can revise abstracts up until the last date for abstract submission. After that, authors can view abstracts but they cannot make changes. Admin has the option to open abstract editing after submission date for those abstracts which have been accepted. The Organ Preservation Alliance has partnered with Dryfta to host its annual Organ Banking Summit. The Summit on Organ Banking through Converging Technologies integrates several areas of science and engineering with the aim to tackle mutliple public health challenges. Dryfta is used by companies & universities to build their event registration website, sell tickets online, collect abstract submissions & assign them to reviewers for review, send email campaigns, create event schedule, accept donations, design badges & participation certificates, and manage attendee data using a full-stack event CRM. All from one dashboard. To set up call for papers using abstract management system, Organ Preservation Alliance team has first completed the initial setup of the abstract submission system and then went on to add custom fields to collect abstracts through their abstract submission form and review abstracts through the review submission form. We decided to add a progress bar in abstract management system to keep chairs and admins aware of where they are in the abstract submission process and what is next that is to be done. This progress bar progressively displays the task that needs to be done in the abstract management system, marks completed tasks as done and keeps admin updated on the currently ongoing activity in the abstract submission system. Starting from setting up abstract submission to collecting abstracts, assigning abstracts to reviewers and making decisions on the reviewed abstracts, it covers the whole aspect of abstract management and peer review. When Autodesk team initially thought about using Dryfta to manage their events, they were primarily interested in using our abstract management and peer reviews system to host their call for papers for 12 conferences across the globe including Australia, Brazil, Middle East and ASEAN countries. Later, after we walked them through an extensive demo and explained them about our various other offerings, they decided to use Dryfta for other more important requirements including tasks workflow and management for speakers, program/sessions management, and a multi-lingual platform with support for RTL languages. Except a few customization, they have used almost all of our features as is. If you charge a processing fee per abstract submission or per accepted abstract submission for your conference, then Dryfta event platform is for you. Using Dryfta, you can create tickets to collect abstract submission fees for all submitted & accepted abstracts. For abstract submissions, as soon as the fee payment is confirmed, the system would allow author to submit the abstract/s. Admin can select the number of abstracts that can be submitted per ticket and set the dates for abstract submission site to open and close abstract submissions. 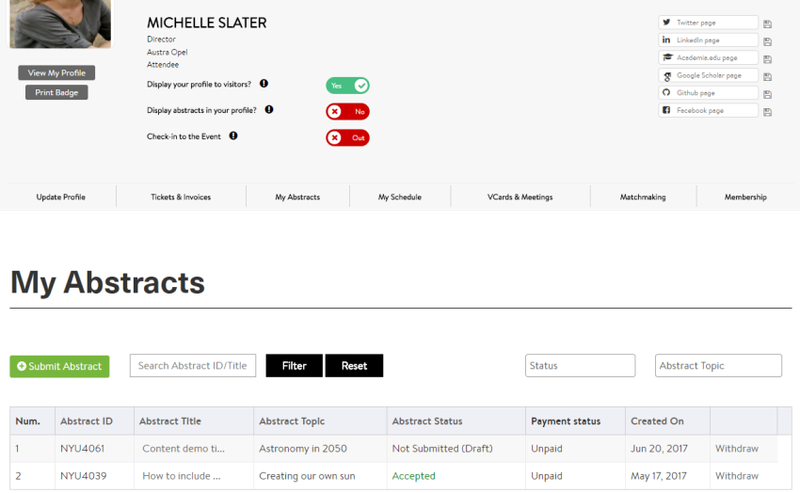 For fees paid for accepted abstracts to allow authors to present the paper at the conference, once author has paid the fee through credit card, the system would send the invoice to the author and updates the abstract submission with the Paid status automatically. This makes sure admin knows if the accepted abstract has been paid for or not. Hosting an academic conference? Accepting abstract submissions? Looking for a tool to accept payments on approved submissions? Dryfta already provides tools to manage your conference and accept abstract submissions and peer review them. With last week’s update, event organizers can now use Dryfta to accept payments from authors for approved submissions. If you have not used Dryfta before, give it a try. Click here to sign up for a free account. If you are already using Dryfta, here’s how you can set up your conference website to accept payments for approved abstracts.